X : Can We Have A Late Check Out ? Y : For late check out, advance request is required then we can block your villa until we drop you back to the airport with an additional charge of 50% of 1 night rate. X : What are the facilities in the Villas ? Y : Parking area, private pool, kitchen with modern appliances, washing machine, hair dryer, safety box, cable tv, dvd and stereo system, IDD telephone, library are available at the front office, free wi-fi internet access in every villas. X : Is there any internet connection in the villa ? Y : We provide free wi-fi internet access. X : How far is the beach from dyana villas ? Y : 10 minutes walking distance to the beach that is located at the dead end of the street. X : Is there a chef available who can cook meals for us? Y : we don’t have a professional chef here, but the housemaids can cook basic Indonesian food during their working time. You could also hire a professional chef from an outside restaurant. X : How about money charger ? Y : There are some good money changer nearby but you can change your money just at front office using the same rate as the money changer is. X : Can you arrange for Tour or something ? or where we could get that information ? Y : We provide all brochures and information for tours and activities in Bali. Reservation can be done by the front office attendants. X : Can I pay by credit cards ? Y : we accept visa, MasterCard, Amex, JCB, dinner without any additional charge. X : How can I change my booking from your website ? X : Could you please tell me check in and out time ? 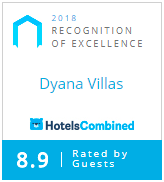 X : Is there any babysitter service in dyana villas ? if yes how much we should pay ? Y : Yes, we can provide for USD 5.00 net/hour/babysitter. X : If we want maid cook after their duty time, is there any additional charge ? Y : If you need your maid to cook after their duty time (4pm) additional charge will be applied at USD 4.00 net/hour/maid. X : Do you have any extra bed ? X : What is your room size ? Y : All Our rooms are 20m2 (5mt*4mt) with a 2mt*2mt king size bed, air condition and attached bathroom. X : Could I order food from the villa ? Y : Yes, we provide 1 book named “ hallo restaurant” in every villa, it offers various menu from many surroundings restaurants who offer home delivery service.